Health is a major concern on everybody’s mind these days. With sky rocketing medical expenses, the possibility of any illness leading to hospitalization or surgery is a constant source of anxiety unless the family has actively provided for funds to meet such an eventuality. Most families rarely provide for healthcare, and even if they do, it is grossly inadequate. 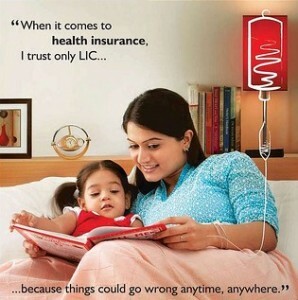 Given this scenario, LIC has launched A Unit Linked Plan i.e. Health Protection Plus (Plan No.902). It’s a unique long term health insurance plan that can combine health insurance covers for the entire family (husband, wife and the children). No policy loan will be available under this policy. The premium payable under this product is eligible for Section 80(D) benefit of Income Tax Act, 1961. Hospital Cash Benefit (HCB) and Major Surgical Benefit (MSB) along with a ULIP component (investment in the form of Units) that is specifically designed to meet Domiciliary Treatment Benefit (DTB) / Out Patient Department (OPD) expenses for the insured members. A daily benefit is payable in case the insured is hospitalized due to either accidental body injury or sickness. The quantum of benefit depends upon the level of cover opted. *The Applicable Daily Benefit. IDB is applicable during the first year of risk cover. The daily benefit will increase @5% simple p.a. of the IDB on each policy anniversary until it hits a cap of 1.5 times the initial benefit. IDB of the spouse cannot exceed the Principal Insured’s IDB; IDB of the children cannot exceed the spouse’s IDB. The initial HCB must be in multiples of Rs. 50. #Initial daily benefit that is payable in respect of stay in a non-ICU room or ward. In case the insured is required to stay in the ICU of a hospital, an enhanced rate of daily benefit is payable, which is twice the eligible daily cash benefit. A lump sum benefit (regardless of the actual costs incurred) equivalent to the percentage of the sum assured mentioned against that surgery will be payable on providing proper proof of surgery to the satisfaction of the corporation. The Principal Insured can claim an amount equivalent to the actual expense he or she has incurred in respect of any domiciliary treatment or to meet the medical expenses incurred over and above the hospital cash/major surgical benefits in respect of either oneself or the others insured under the policy. .
No death insurance cover is available under the plan. Following benefits/charges will take place on the happening of unfortunate death of principal insured (PI) and/or other insured member. a) On death of the PI (if policy is issued on single life) or on death of all Insured members (if more than one life is covered under the policy). The Policy Fund Value will be payable to the nominee/ legal heir. b) On death of PI (if other Insured members are there). The payment of premiums will cease and the cover will continue for the other Insured lives till the fund is sufficient to recover all the charges or till the maximum benefit ceasing age for each of the Insured lives, whichever is earlier. c) On death of insured member(s), other than PI The payment of premiums and the cover for PI and other Insured members, if any, will continue.